It is clear by reading One Thousand Gifts that Ann Voskamp reads and admires several mystics, panentheists, and universalists. Her book is peppered with quotes by Sarah Ban Breathnach (a New Age author launched into stardom by Oprah), Teresa of Avila, Julian of Norwich, Evelyn Underhill, Brennan Manning, Annie Dillard, Thomas Acquinas, Buddhist sympathizer and Catholic convert Peter Kreeft, Walter Brueggemann, Francis de Sales, Jesuit priest Pierre Teilhard de Chardin, Henri Nouwen, and Jean-Pierre de Caussade. Many of the statements Voskamp says in her book would resonate with these authors showing that Voskamp has absorbed some of the beliefs of these people. In addition, Voskamp’s popular blog lists a number of contemplative/emerging authors on her book list page: Richard Foster (Celebration of Discipline), Adele Ahlberg Calhoun (Spiritual Disciplines Handbook, a primer on Eastern style meditation), and emerging church author Phyllis Tickle are included. We find Voskamp's mixture of sexual and spiritual language when referring to a relationship with God offensive. The most “intimate” relationship anyone ever had with God on this earth was the one Jesus Christ had with His Father; but nowhere in the Bible does Jesus (or the disciples) use sexual language and innuendos to describe the relationship between God and man. And in fact, the Bible tells us that sexual union was given to man, in the confines of marriage between a man and wife, for procreation; the Bible also tells us that in our eternal heavenly home, there will be no marriage (the need for procreation will not exist). If we, as Christians, were supposed to think about our relationship with God in sexual terms, wouldn’t God have made that clear in His word? It’s like the contemplative prayer movement that emphasizes repeating a word or phrase over and over to be intimate with God. But nowhere are we instructed to do this in Scripture. It’s as if the Holy Spirit who inspired men to write the books of the Bible left out vital elements that now contemplatives and emergents are enlightening us to. God forbid that we should think so. 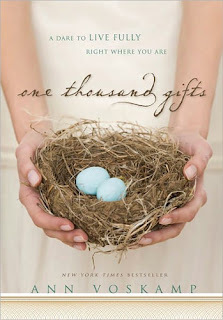 Books like One Thousand Gifts have added to what God has said in His Word. Interview On "A Trojan Horse in Healthcare"
Chain Emails, and What Exactly Is the Gospel?